Wow, it took me a long time to come up with that title! Clearly, it's time to move to Plan B for the post titles! I think I'd name this one Barney. On the left - carrots, deli pickles (got a bit smushed on the way home), cheddar cheese puzzle pieces cut with The Lunch Punch puzzle set. On the right - strawberry cereal bar (cut in half), a couple animal crackers, a homemade granola bar (wrapped in wax paper as it's a bit crumbly), raspberries. Only 2 days left for Autism Awareness Month! "For many people, Rain Man is the image of autism. However, only 10% of autistic individuals have savant skills & half of all savants are not autistic. Kim Peek, the savant who inspired the character of Raymond Babbitt, was actually not autistic, but instead is suspected to have had a genetic condition known as FG Syndrome. This is Autism Awareness Month and this is me making you aware!" Barney looks delicious :D and I love that flair button! Wow, you fit alot in those Sassy boxes! I packed one for Princess #1 yesterday for lunch and today she asked me to not use it because yesterday she finished her lunch first and was still hungry. Oops! Gotta get better at squeezing more food in I guess! I just wanted to thank you for all of the fun comments you have made on my blog. I'm so glad the Parmesan Chicken worked out well for you! You have a fun site here...I'm happy to know about it. 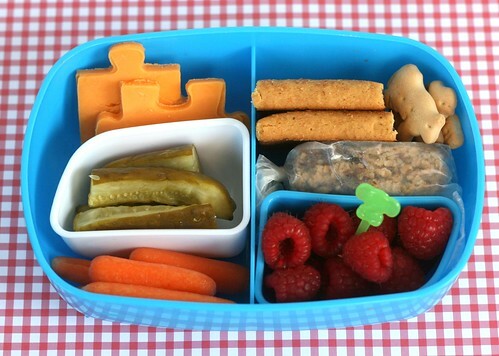 My kids would roll over with amazement at the site of these lunches. We are in a real Peanut Butter and Jam rut. Looks like fun! You've inspired me. My daughter is loving her new improved lunches. At least they look prettier and more fun. I've been making sure to add more color and food choices. Mixing it up instead of the same old thing everyday. Makes me want to go back to 2nd grade! Love it. Really cute! I am very new to Bento...as in bought a couple boxes, not yet filled them. My kids are just starting school...my 7 year old son has autism. He has in home IBI therapy 5 days a week now...he is going to be starting 1 half day of grade one soon, and 1 full day a week of grade 2 next year... I am a bit nervous about packing him a cold lunch... as his sensory issues are severe, he is so picky! Do you have the same issues? I found your blog today, and love it!